Victoria Ross’s father has been a beef cattle rancher for almost 50 years, and she grew up on the ranch. And she knows that hard work doesn’t always pay the bills. “On top of all the hard labour intensive farm work, [my father] was also doing a fulltime night job… He had to do both jobs to pay the bills,” said Ross, the founder of aGRO Systems. In university, Ross started researching Canadian farmers, to see if other families experienced similar struggles. She found that around half of all Canadian farmers need a second job to make ends meet. Using her familiarity with Canadian farming and land sustainability, Ross started looking at the applications and possibilities for waste in farming. This inspired her to start aGRO Systems. Alberta is Canada’s largest beef producer and, as such, also the largest beef manure producer. aGRO systems began with the aim of making this waste into something useful: electricity and fertilizer. Both are major expenses for farmers. This could be achieved with an onsite machine to capture the methane from the manure while converting to fertilizer. The methane could then be used for some basic power needs in the barns, while the fertilizer goes to farmers’ crops, making waste into a multipurpose asset. 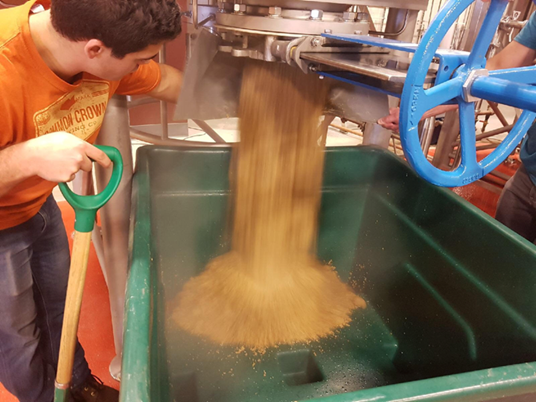 While working to make this system efficient and affordable, Ross came across another pressing waste problem, this time in the brewing industry. In taking on this waste, aGRO could provide a service to local breweries and farmers, as well as the environment, since they are able to provide a cost-efficient solution for both, while making use of something that is traditionally thrown away. In the future, aGRO Systems hopes to continue developing cost-effective models of the systems they created, with the aim of supporting Alberta’s producers in reducing both waste and their costs, while generating energy. Ross’s enterprise is the perfect example of a young Albertan innovator confronting local problems and using the principles she was raised on to generate a win-win solution. Learn more about aGRO Systems, here. For more information on bioenergy in Alberta, see our resources page. What happens to waste we can’t recycle or compost? In much of the world, it’s destined for a landfill or incinerator. In the landfill, waste emits methane, which is about 25 times as potent a greenhouse gas as carbon dioxide. Incinerating garbage can be used to generate electricity, but that also emits large amounts of greenhouse gases. Canadian company Enerkem is changing that. It took 15 years of research for the Chornet family, who founded the company back in 2000, to develop a unique world-leading technology. After creating a pilot and small-scale demonstration plant, the stage was set to build an industrial-scale operation. Enerkem’s Alberta Biofuels facility opened in 2015 in Edmonton, the world’s first commercial scale facility to produce clean energy from waste. Around this time, the City of Edmonton was looking into more ways to divert waste away from their landfill. The landfill was nearing capacity, and even though Edmonton had a strong recycling and composting program, only 50 per cent of its waste was being diverted from the landfill. At first, the biofuels facility turned garbage into methanol, a flammable liquid used in hundreds of household products like paint, glue, automotive parts and textiles. Enerkem recently upgraded the facility to be able to also produce ethanol, which is used as a biofuel and can be mixed with gasoline. The facility can divert 100,000 tons of garbage from the Edmonton landfill each year, and creates 40 million liters of ethanol from that process. Boisseau promotes Enerkem’s technology to a diverse audience to gain visibility and awareness. The response to this facility has been very positive, he said, both in Edmonton and around the world, adding that because their technology compliments instead of competes with recycling and composting, cities have been quick to embrace it. Enerkem is now getting attention from across the world, from other cities and countries interested in turning landfill waste into usable fuel. The next Canadian facility Enerkem is building will be in Montréal, and there are other potential projects including in the Netherlands, Spain, the U.S. and China. Learn more about Enerkem’s Alberta Biofuels facility, here. Millar Western has a sawmill and a pulp mill in Whitecourt, two hours northwest of Edmonton. The modern sawmill is a marvel of modern technology, mostly devoid of humans and full of machinery to debark logs and cut them down to usable lumber. Only about half of the log is turned into lumber. Most of the other half is chipped and fed to the pulp mill. The remaining 10% is considered waste. Millar Western produces about 250,000 tonnes of bark, sawdust, shavings and other assorted woody leftovers per year. In the past these leftovers were burned in a beehive burner, but the Alberta government is slowly phasing them out, so Millar Western built a 25-megawatt biomass-fired power plant, Whitecourt Power, where burning waste can generate electricity. When the forest is managed properly, the resource is a lot closer to being carbon neutral than coal or natural gas. This plant has EcoLogo status, which means they use only “clean” wood – no construction waste or painted or treated materials. That certification means they can sell renewable energy credits (RECs), giving them a small ancillary revenue stream. “We get paid for electricity we sell, we get paid by farmers for our wood ash that we take to the farmers’ fields. We get paid for the RECs that we sell, and we also get paid a small amount from Millar Western for the waste wood.” says Brennan Anderson, operations manager for Whitecourt Power. The electricity they produce is the largest source of revenue. The other big advantage to burning wood waste for power over using a beehive burner is the pollution controls. “As for what comes out of our stack, it’s pretty much mostly water vapour. We remove 99.9% of particulates with the baghouse, and our CO and oxides of nitrogen emissions are well below our approval limits. So, in comparison to a beehive burner, we are far away the better way to go,” says Anderson. Millar Western is now building a small five-megawatt $92-million project that will collect and burn biogas taken from their waste sludge. The project is small relative to the mills’ thirst for electricity — the sawmill and pulp mill together consume more than 85 megawatts of electricity. If burning the wood waste from forestry companies for power is done on a wide scale, forestry companies could play a much more significant role producing renewable electricity. For more information on how to undertake your own bioenergy project, check out the resources page. The Alberta Pacific Forest Industries (ALPAC) pulp mill near Boyle in northern Alberta is North America’s largest single-line Kraft pulp mill. FSC certified for progressive forest management, ALPAC has what may be the biggest wood yard in the world. Each year it takes in 3.38 million cubic metres of aspen, balsam poplar, birch spruce and pine. But the mill’s raison d’etre is to harvest aspen. In Alberta, one out of every two trees is aspen and while the wood does not make good lumber it can be turned into pulp and made into any number of paper products. In 2009, ALPAC installed a condensing steam turbine to make electricity from its waste wood. Most of the 2.56 million cubic metres of aspen ALPAC harvests each year is chipped and tossed into a chemical cocktail called “white liquor” that breaks the chips down. The leftover chemicals are known as “black liquor,” and burned to power ALPAC’s operations. Aside from using its waste to serve its own power needs, ALPAC has a 32-megawatt power plant that contributes power to Alberta’s grid. “We process logs and from those logs and what we get from that is bark and residual waste from that process. That goes into what we call a biomass pile. We fire that into a power boiler. And we burn that to make steam and power,” says Daryl Nichol, the vice-president of pulp at ALPAC. About 450,000 tons of this waste fires the power boiler a year. Turning these former economic hubs into green power nodes, burning biomass for power, might be a way forward for these communities. Inside the recovery boiler nozzles spray this black liquor into an inferno; an 11-storey tall boiler that together with the power boiler drives two giant high-pressure turbines. ALPAC received $63 million in federal subsidies to build the power plants and to upgrade their transmission lines and build a substation. On an annual basis ALPAC brings in $14 to $18 million from selling power to the grid, about $2 million in carbon credits and $7 million from the Alberta Bio-Producer credit program. But the forestry industry in Canada isn’t doing too well overall. It has shed 118,000 jobs in the past 10 years as operations shut down. Turning these former economic hubs into green power nodes, burning biomass for power, might be a way forward for these communities. And perhaps there is a lesson for these communities to learn from Finland. Their pulp and paper mills actually turned into utilities. Finns get almost one third of their electricity after industrial consumers have used it. In a low carbon economy it makes sense to recycle your power like this. Alberta has over 350 megawatts of installed biomass capacity. That’s the equivalent of a large, centralized fossil fuel power plant, but instead of burning coal it’s burning something that grows.